Now that we are a few days into this new year, the celebrations have ceased, the festivities have fizzled and you are struggling to get back into the swing of things. You are totally out of routine, having loosened your grip on healthy habits for the sake of “special occasions”. Too much pork roast and roasted chicken, buttered and smothered side dishes, sweets, treats and other such indulgences have left you feeling slow and sluggish, unmotivated, uninspired and well…just plain blah. It’s time to get back on track. So, let’s clean out the cupboards, prepare the pantry and get ourselves a fresh start. Any time I find myself in a food funk, suffering the effects of a temporary lapse in healthy eating habits and moving in slow motion, I always turn to what my mama used to call a “green drink”. 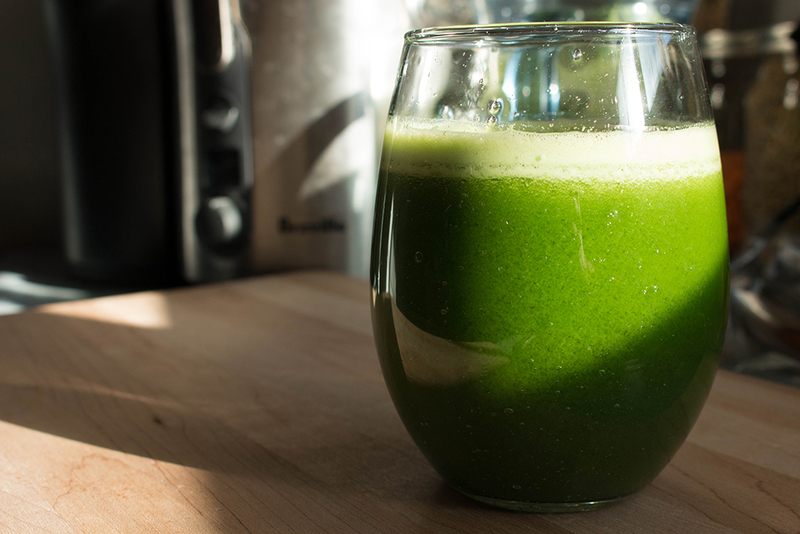 When seeking motivation for a fresh new start, a tall glass of freshly juiced greens always does the trick for me. All those nutrients, vitamins and minerals going straight to every little cell, as if to say: It’s okay, help is on the way! 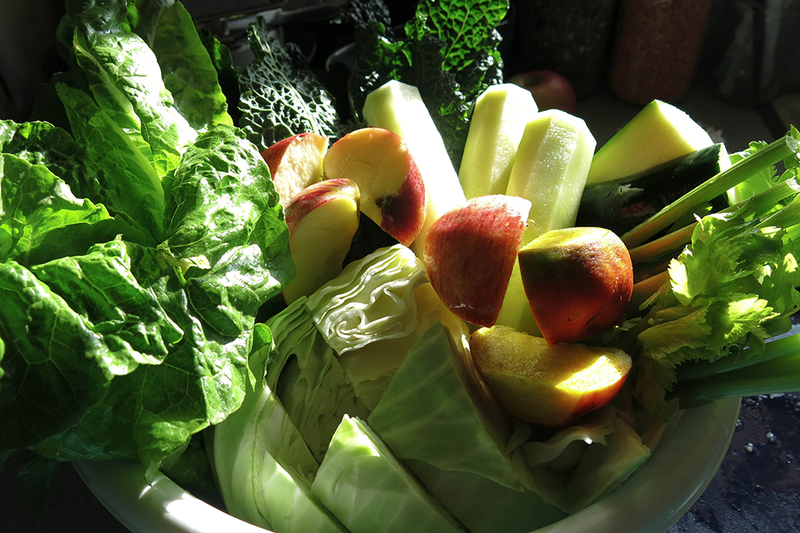 When I find myself in such a state, I round up the veggies, fire up the juicer and wait for the impending inspiration. I like my juice as green as can be, but an apple or a golden beet add just enough sweet. Add to that a squeeze of tart lemon juice plus a little zing of ginger root and you have yourself that perfect yummm balance. With a glass of this glorious liquid vibrancy revitalizing your system and a big bunch of fresh vegetables washed and ready to go, I’d say the first order of business is to create a detoxifying raw veggie salad to have on hand for some light lunches and healthy snacking over the next few days. I don’t believe you need a recipe to create a mean, clean, detoxin’ machine. 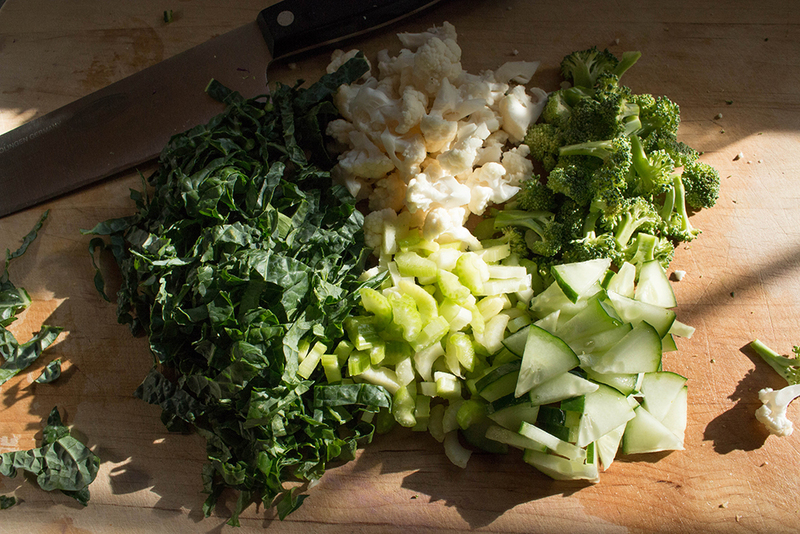 Raw cruciferous vegetables are great detoxifiers and there are so many to choose from. Kale, cabbage and cauliflower. Broccoli, beets and brussels sprouts. 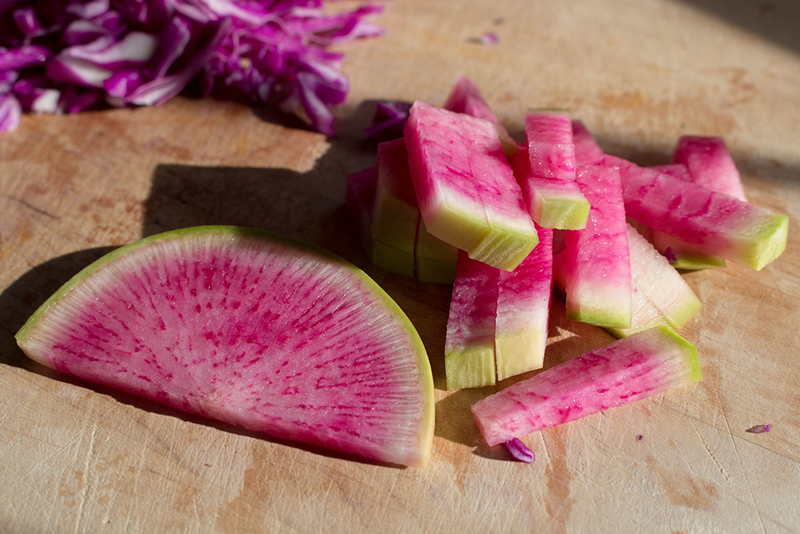 And radishes…who knew radishes came in so many colors? Black, white, purple and red (not to mention, the watermelon ones), take your pick! Select yourself a variety of purifying cruciferous, chop ’em, toss ’em and top ’em with whatever superfoods suit your fancy and you suddenly find yourself making your way back to those healthy habits. This is one of those situations when I like to use up whatever happens to be in the fridge. And having reached the end of this season of hustle and bustle, giving and receiving, complete and total indulgence, it happens to be a mod-podge, a motley cruciferous crew. But they will do. A salad such as this is the perfect way to use up the last of the random veggies (like those watermelon radishes) lingering in the produce drawer and longing for a purpose. Besides which, I find cleaning out my produce drawers to be a fail-safe method of motivation in kickstarting some clean eating habits. You don’t have to invest in a library of new “clean eating” and “detoxifying” cook books to get your system back on track. I don’t believe you need to spend your hard-earned and recently depleted fortune on a massive purchase of organic produce and exotic superfoods in order to prepare your pantry for a fresh start. Keep it simple. Look at what you have on hand, add in a new staple or two and that should do. Just remember that little list of cruciferous vegetables and try to include as many as you can. Having something like this, looking so attractive and readily available, helps in making lunch choices simple and clean throughout the week. Especially when time is tight. 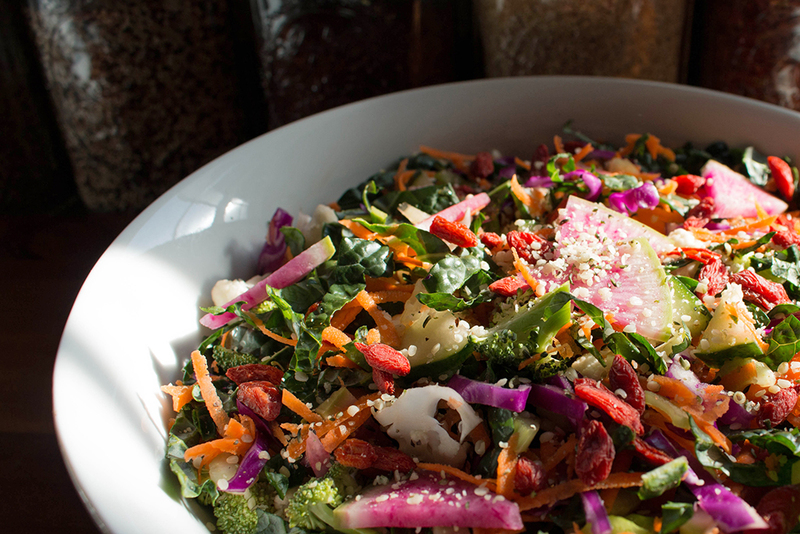 Keep a large bowl, undressed, in the fridge with a simple, light dressing and some superfood sprinkles standing by. 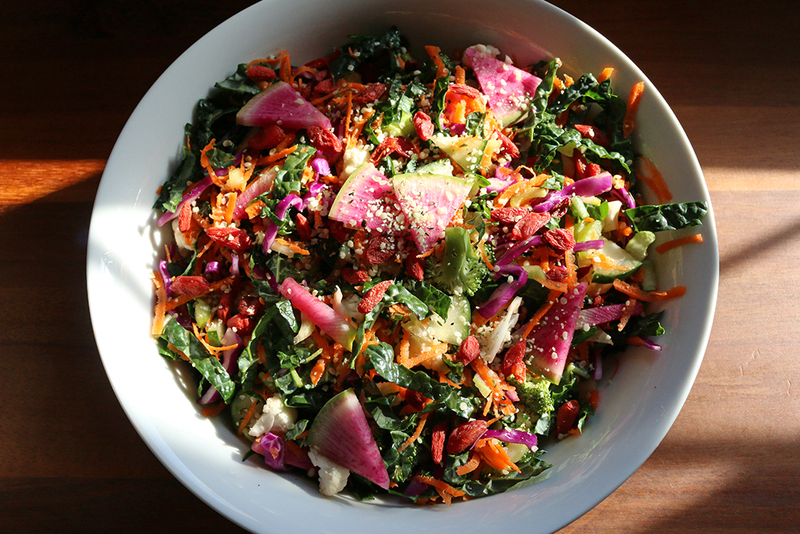 A handful of super seeds and a dried goji berry or two is an easy way to supercharge your salad’s cleansing power. And speaking of super seeds, it’s time to take stock. With a clean fridge and the beginnings of a grocery list, we are fully motivated to clear the clutter and start fresh. Cleaning out the kitchen cupboards and preparing the pantry for some clean cooking will help keep you motivated throughout the week. Like I said, I don’t believe you have to break the bank, but stocking the pantry with a few healthy staples is essential in establishing a fresh start that will last. Finding a few favorites, keeping them close and making them easily accessible makes a much easier task of healthy meal planning and preparation. 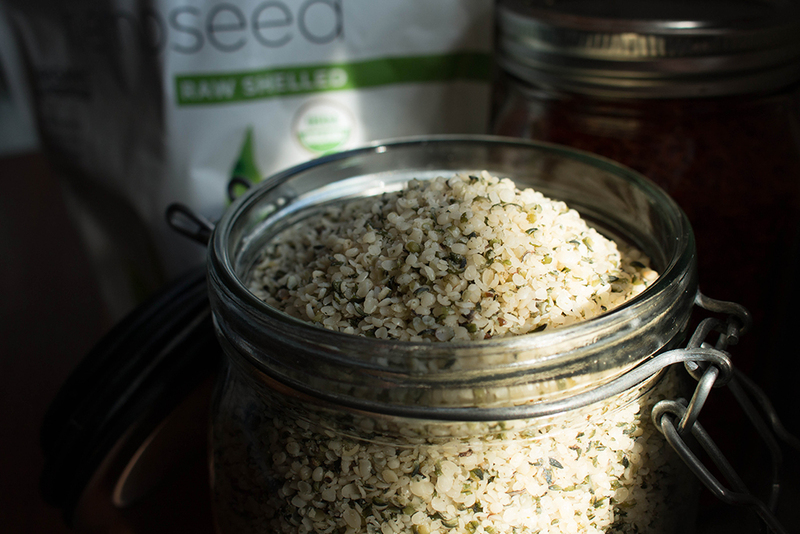 Raw, shelled hemp seeds, chia seeds and goji berries are the go-to superfoods in this household. If I could only pick a few, it would be these. A jar full of each, well within reach, makes it so easy to add an extra nutrient-dense kick to not just your salads, but your cereals, smoothies and sweets as well. 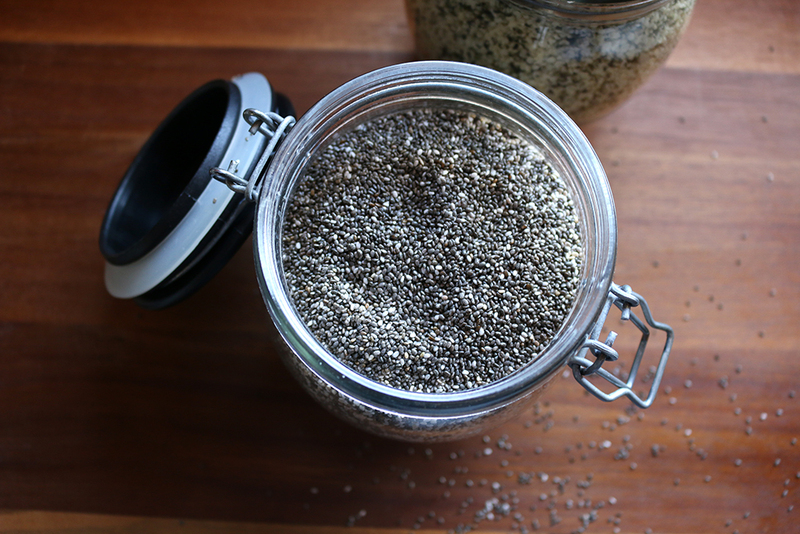 We always have a jar full of hemp and chia seeds in the fridge. On the countertop, a large glass jar filled with goji berries constantly beckons your hand to dip in, enjoy a few…or a fist full…okay, maybe one more. Which leads me to this concept of the jar. I love jars filled with beautiful things. They delight me, excite me, invite me to partake of the contents, whatever they may be. 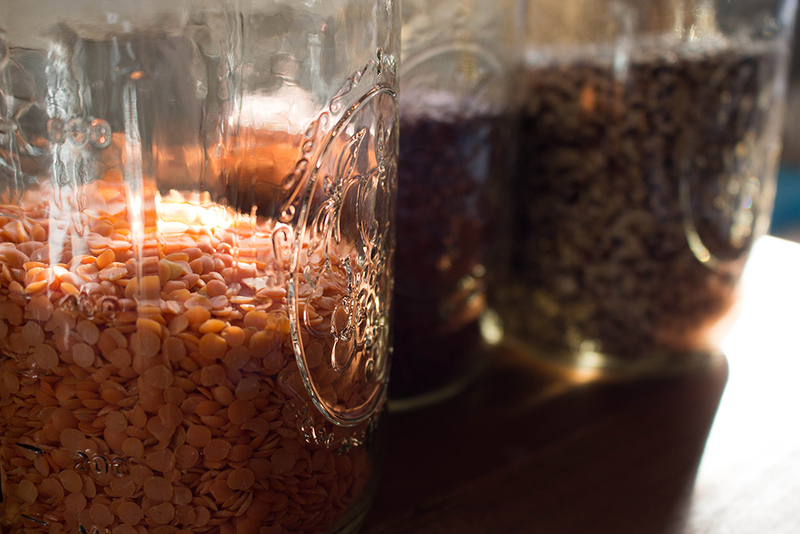 I like to store my grains and legumes in glass jars on the countertop. Yes, they occupy precious property in the neighborhood of counter space, but they are well deserving of it. They give my kitchen curb appeal with beautiful color and texture. And sometimes catching a reflection of morning sunlight through a glass jar of red lentils is all it takes to inspire a nourishing meal. I actually only have a few different types of grains and legumes in my repertoire of pantry stapes, as I have narrowed the choices down to a handful of favorites. I have thrown out many a jar of unused and unloved grains over the years and I do hate being wasteful. So, over time I have limited my stock of staples to included only those that we actually enjoy eating on a regular basis. However, I do love having several varieties of each on hand. 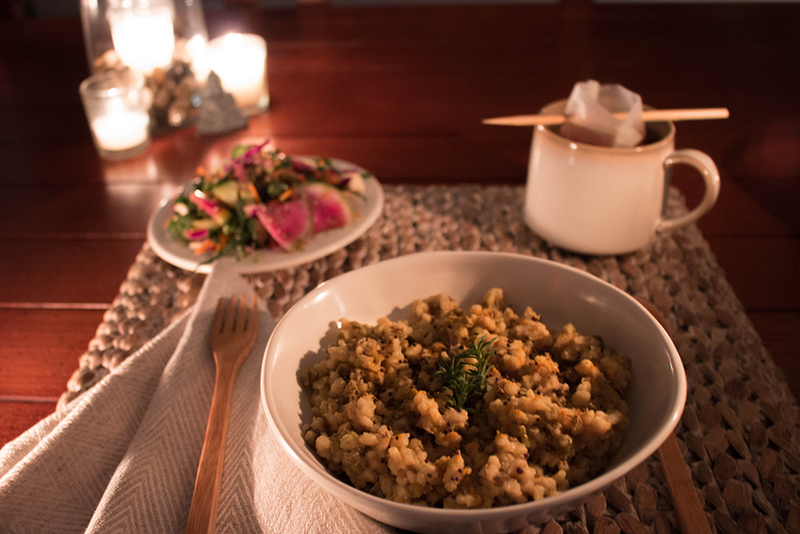 We love lentils and quinoa and sometimes rice. I stock red lentils, black lentils and green. White quinoa, red quinoa and a mix of in between. Brown rice, wild rice and sometimes red. Getting a fresh start doesn’t necessarily mean you need to turn your kitchen pantry into an arsenal of grains and legumes. Be practical. Find what you like and look for variety within that. After all, aren’t the things we love the things that inspire us most? So, with the power of greens nourishing our every cell, fresh produce chopped and ready for Operation Detox and a small grocery list of produce and pantry staples to be purchased, we are fully motivated to make ourselves a fresh start. 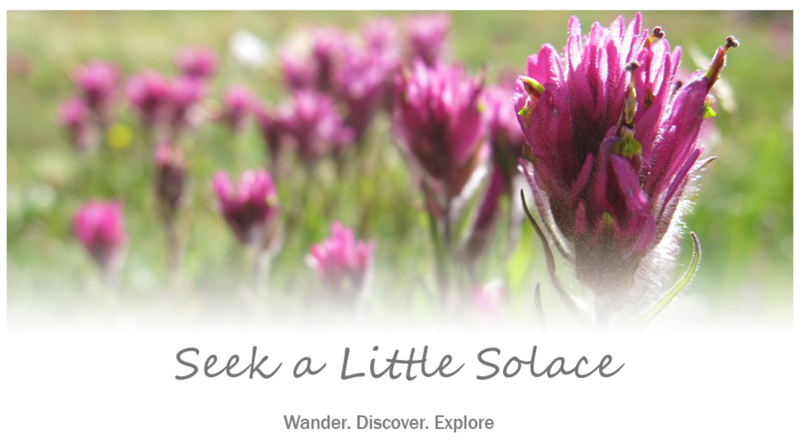 Now it’s time to allow ourselves a few moments of me-time to sit back, relax and thoroughly enjoy the task of looking for inspiration. So, let’s prepare a hot cup of tea and pull out a good book. 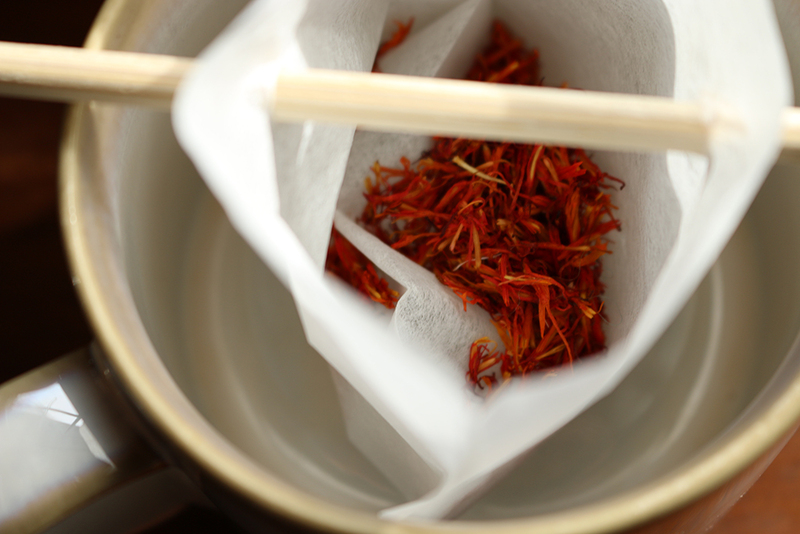 My husband has been into this sweet saffron tea lately, so it occupies some prime property on the countertop. I love the pop of color it adds to my jar decor. 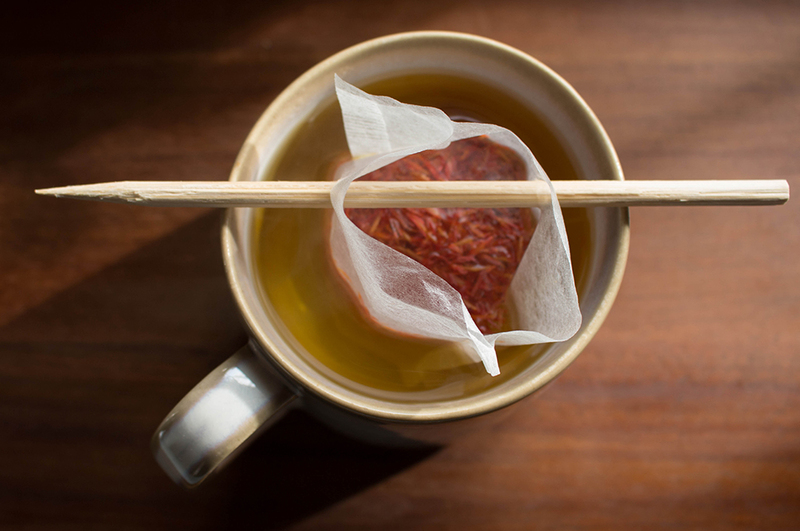 Its flavor is mellow and sweet and saffron tea is supposed to have many health benefits. It is said that it is good for the colon and aids digestion, so it seems a practical choice for our gentle cleansing efforts. Just boil some water, pour it over a teaspoon of dry tea and let it steep. I am not a big tea person, but sometimes a calming cup of hot tea and a good book are just what I need. I firmly believe that giving yourself a few moments to indulge in the act of seeking inspiration is absolutely vital to motivation. And yes, sometimes seeking inspiration may seem an indulgent and unnecessary waste of time, but a slight shift in your mindset may be all it takes to start fresh with some lasting healthy habits. Again, I think it is important to look for inspiration in the things you love. You might be an internet gal, a Pinterest person or a Food Network guy. 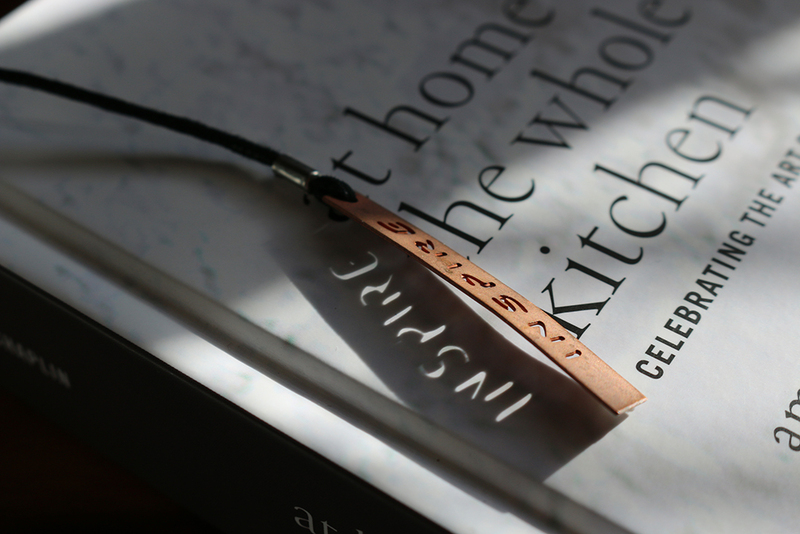 I, myself, am a cookbook girl. When I find myself feeling slow and sluggish, unmotivated and uninspired or in a general food funk, I pull out my favorite cookbooks (the ones with the beautiful food photos) or I gift myself a brand new one and I allow myself the time to leisurely peruse the pages looking for inspiration. This particular book is a fairly recent purchase and though I have flipped through it a few times, I have yet to actually sit down and pick out a recipe to try. At Home in the Whole Food Kitchen is filled with nourishing, plant-based recipes that embrace the beauty and simplicity of whole foods. The photographs are lovely enough to make this book worthy of that perfectly poised position on the coffee table. 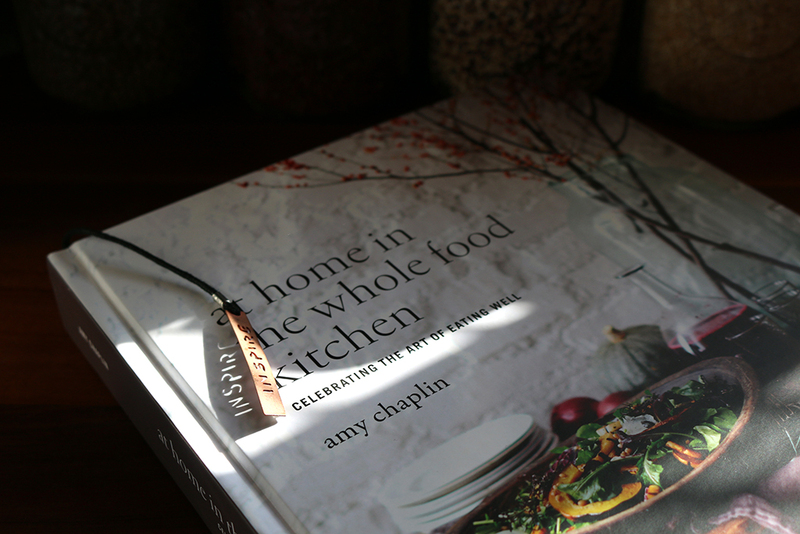 And Amy Chaplin totally got me with the first sentence in the first part about the pantry: “A well-stocked whole-food pantry has always been a place of inspiration and magic for me.” Oh yes…this book is right up my alley. I am officially inspired. When I saw the recipe for her kitchari I immediately bookmarked the page. Kitchari is a purifying dish often used in Ayurvedic cooking. Because it is easy to digest and gentle on the system, (not to mention a very simple and satisfying dish) it seems a perfect choice for clearing the clutter and getting our bodies back on track. 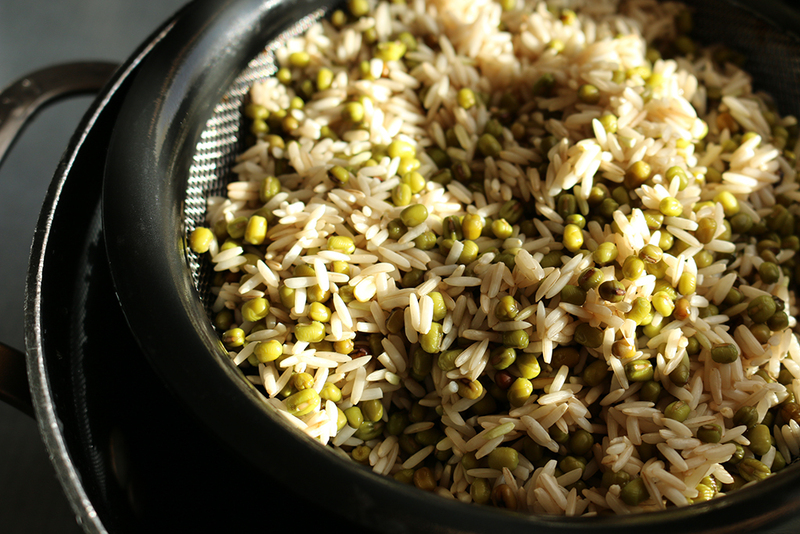 There are many variations of this dish, but it is often made with lentils and white basmati rice. 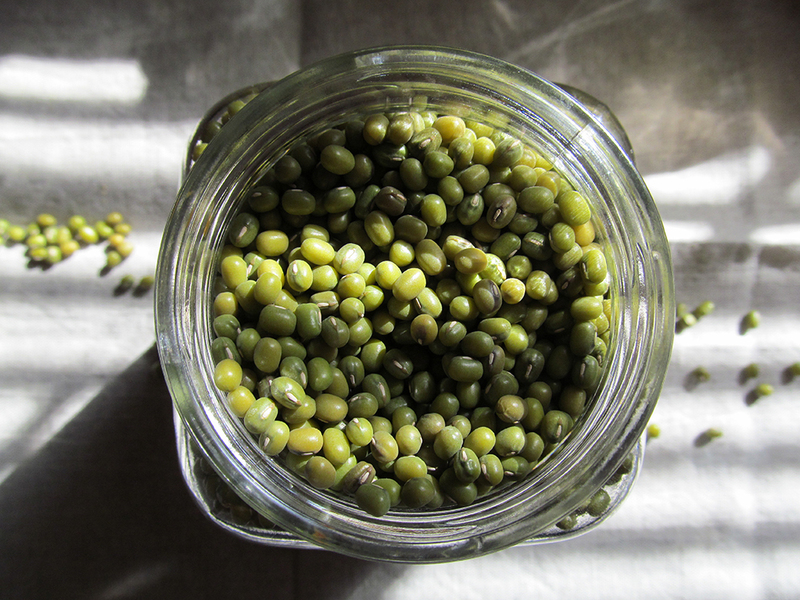 I like Amy’s recipe because she uses mung beans and brown rice, which I much prefer. There’s not much to it, just some mung beans, brown rice, some ginger and spice. It is simple to prepare, provides more than enough for lunch and leftovers (and it is equally appropriate for breakfast), leaves you feeling light, satisfied and slightly purified. 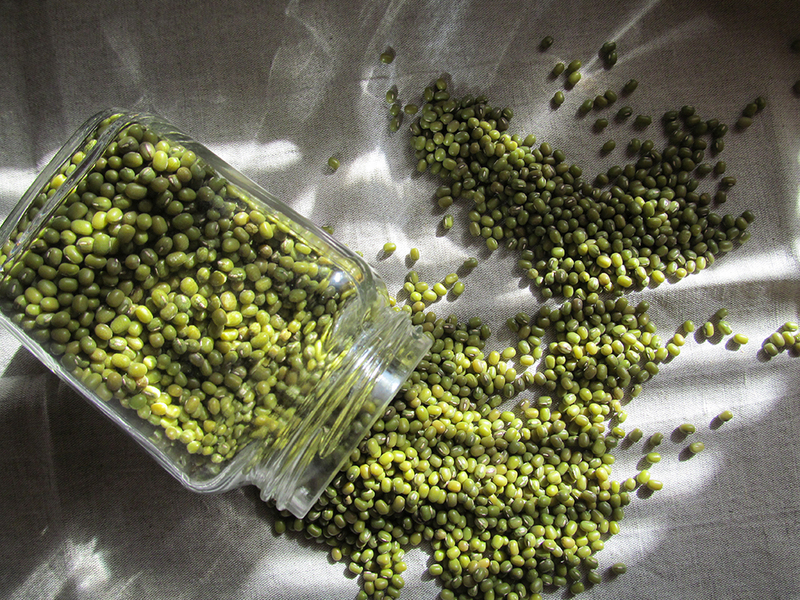 And it provides the perfect purpose for those beautiful, yet neglected mung beans that were recently down-graded to the cupboard space. The recipe in this book says to soak the rice and beans overnight, but I have a tendency to take shortcuts in cases like these. After a throughout rinsing, I put the mixture in a bowl, covered it with boiling water and let is soak for a couple of hours. I am not sure if it’s a “proper” way of preparation, but I am never a stickler for those things. 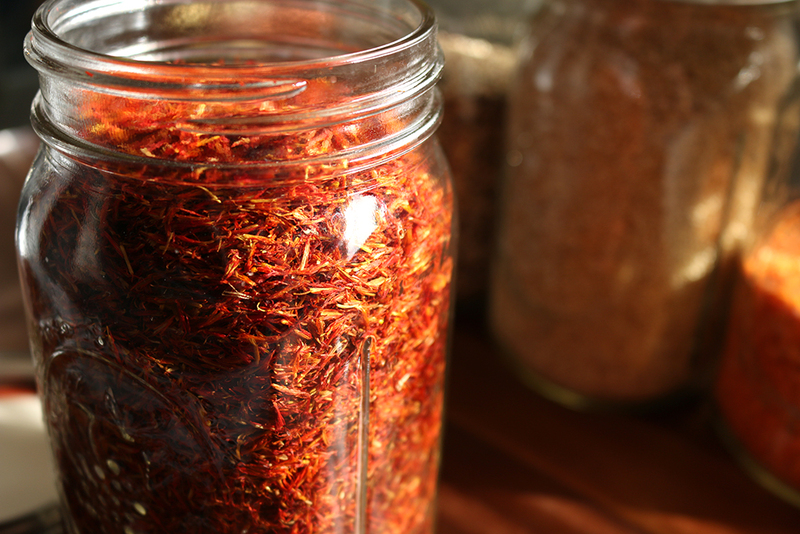 The spices are simple, yet provide a delicious flavor. 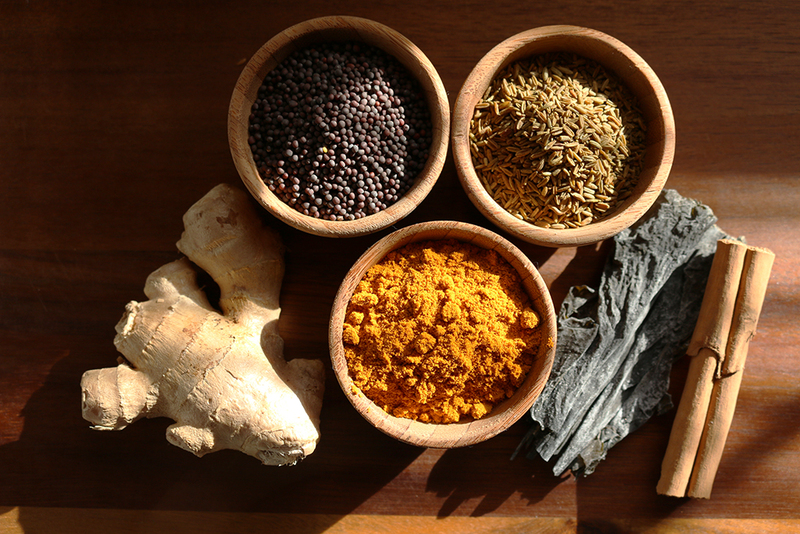 Fresh ginger, turmeric, black mustard and cumin seeds. A cinnamon stick, some dried seaweed (kelp or kombu) is all you need to flavor this simple cleansing dish. I did add a few cloves of freshly minced garlic, just because everything is better with garlic. If this type of meal appeals to you, I highly recommend this book. It’s lovely, it’s motivating and it is definitely inspiring. Now that was a day well spent, wouldn’t you say? The fridge is clean and filled with new produce looking all pretty and fresh. We are juiced, rejuvenated and ready to cleanse. We have stocked the pantry with lovely foods that we we love to eat. And we are inspired to try something new. So, it’s time to sit back, enjoy the meal, a soothing cup of tea and some time to simply be. Starting fresh doesn’t necessarily require a complete overhaul. No need to deprive yourself. Making a fresh start for you and your health is a process. It’s kind of like giving a mouse a cookie (which only makes a bit of sense if you happen to be familiar with that little children’s story). If you let it play out, one small change leads to another, which motivates another and inspires yet another. Sometimes the simplest things, like cleaning out the cupboards and preparing the pantry, can lead to lasting changes. Set yourself up for success by working with what you have, incorporate something new and find what you love to do. And keep in mind that sometimes it is the smallest steps that lead to the biggest transformations.